Image Size: 21 X 16 in. 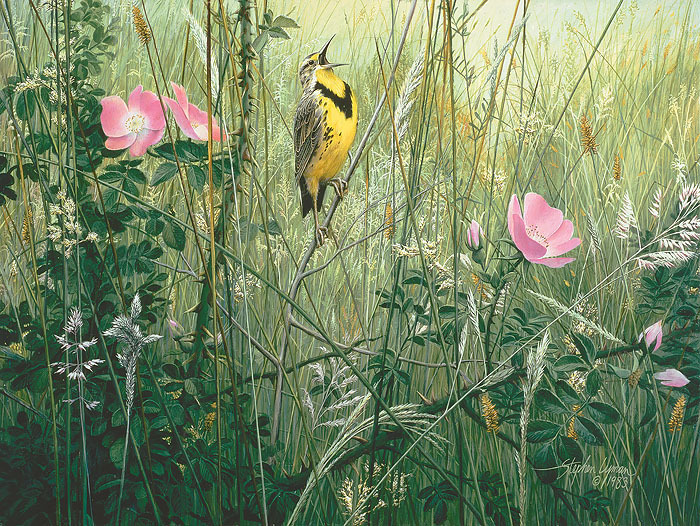 A meadowlark’s joyous voice bursts forth with the new life of spring. The visual harmony is provided by the grasses and the wild roses. Steve Lyman was as much inclined to turn his creative attention to the intricacies and delicacies of the miniature landscape, the seemingly insignificant plants, animals and rock formations he encountered on his treks, as he was to focus on the charismatic “mega fauna” such as bears and wolves.